Bassist Gregg August has a sound on his instrument that’s simultaneously warm and almost intimidatingly strong, the sound of a well-toned muscle repeatedly flexing and snapping. His work with saxophonist JD Allen‘s trio, over the course of four albums, has brought him quite forcefully to my attention; the way he churns the earth between Allen and drummer Rudy Royston, seizing the lead spot as often as he fills in the background, has helped make that group one of the best in current jazz. Now, on his latest CD as a leader, he’s absorbed and augmented that group for four of eight compositions, while putting together an almost entirely different quartet for four more. Half of Four by Six (buy it on Amazon) is performed by a sextet that includes Allen, August and Royston, as well as trumpeter John Bailey, alto saxophonist Yosvany Terry, and pianist Luis Perdomo. The other half of the disc features August and Perdomo alongside soprano saxophonist Sam Newsome and drummer E.J. Strickland. The two groups, obviously, take very different approaches to everything they do – melody, rhythm, improvisation – and may wind up dividing listeners, though it really shouldn’t. The quartet, for obvious reasons, is somewhat dominated by Sam Newsome‘s soprano saxophone; as the only horn player, he gets a lot of solo space, and/but his sound is so individual as to be problematic. He’s spent a long time exploring the soprano as a solo instrument; he released his latest disc, The Art of the Soprano Vol. 1, earlier this year, and it’s rough going at times – as is his work here. His tone is sharp, and he indulges in tongue-popping and other tricks; his phrases, while fluid and serpentine, are nevertheless occasionally abstract to a degree that leaves the listener groping for the stability offered by the rhythm section. Perdomo’s heavy chords come in particularly handy here, especially since Strickland has a somewhat light touch on the drums. This is noticeable in his work with his twin brother, saxophonist Marcus Strickland, as well, but here it’s hard to miss. The sextet, by contrast, is a hard-swinging hard bop ensemble. It’s difficult for me not to think of it as an augmented version of the JD Allen Trio, but compositionally, these guys are doing something completely different. Allen’s pieces are three-minute nuggets built around an evocative melody and brief, intense exploration of its possibilities; these tracks, all by the bassist, have more groove to them, and the horn charts feature harmonically precise blasts of three-way force while providing solid platforms for expressive soloing from all. But the sextet gets some of the album’s most beautiful moments, too, like Perdomo’s solo on the concluding “For Miles.” And when paired up with Royston, August’s playing becomes more emphatic and aggressive, driving the band forward. 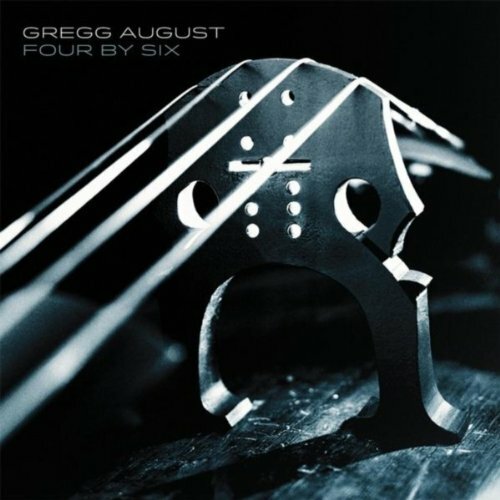 Whether you prefer the more experimental side of Gregg August‘s music, or the more traditionally swinging hard bop side, the two bands presented on Four by Six have much to offer. Albums by bassists who are better known for sideman work than leadership frequently contain very pleasant surprises for the listener; think of Paul Chambers‘ Whims of Chambers, or Cecil McBee‘s Unspoken, or Buster Williams‘ Pinnacle, or any number of Ron Carter albums. This is an excellent record which fans who know August’s work under other musicians’ banner shouldn’t overlook. The reviewer’s statement that Newsome’s sound is so individual as to be problematic has got to be one of the strangest statements I’ve ever read in any form of art/music criticism. A condemnation of individuality? The statement just shows that the reviewer isn’t interested in any extended techniques or anything that challenges him. Fine… but don’t condemn the player’s uniqueness. I don’t mind being challenged, in certain contexts. (Which of course raises the question: If you go in expecting to be challenged, are you really being challenged at all? That’s a longer discussion.) But what I meant there was that Newsome seemed to be working against the larger goals of the quartet. He was effectively relegating them to the background while he demonstrated all the things he knew about the soprano saxophone, as opposed to leading (or joining) the group.